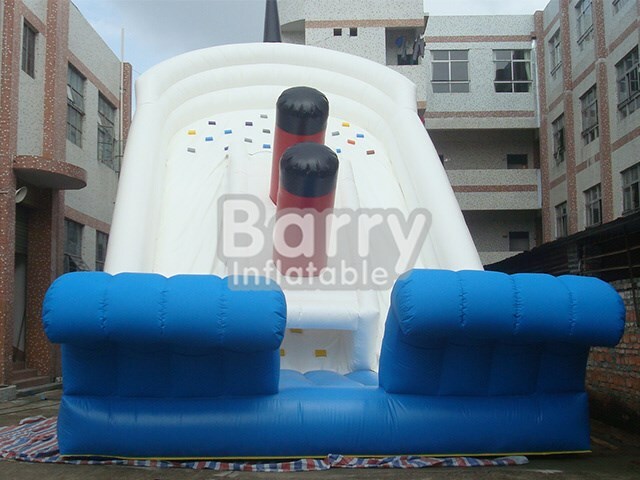 Products - Inflatable Dry Slide - China Supplier Customized Titanic Inflatable Slide For Land BY-DS-007 - Guangzhou Barry Industrial Co., Ltd.
like your on a roller coaster! Great for all ages even for the little ones to climb up. 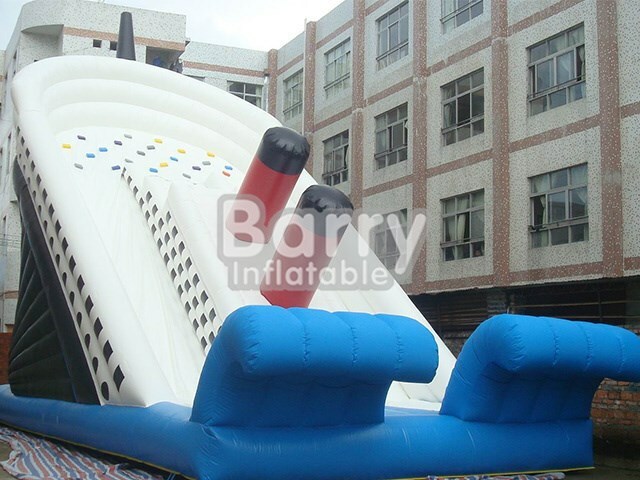 Baffles provide the internal structure of an inflatable.Have you ever seen a bounce house with a mattress that has ballooned out? Blown baffles are likely to blame. That is why we only use baffles that are secured by Commercial Grade Vinyl at 1400*1400 denier that provides maximum strength and durability.This material is also perfect for inflatables used in an indoor environment(as they often receive much more use and abuse)and is key to the legendary durability of our products. We always use at least two rows of stitching on all of seams.But some seams just need a little extra,especially on high-stress areas like a bounce house’s matress. Think of those kids jumping up and down,up and down,up and you get the picture. That’s why we insist on reinforcing each and every one of those critical mattress seams by using a seam reinforcement strip that bridges the seam,thus eliminating the stress. Industry leading digital art work, printed by the best digital printers on the market, We use a fantastic lacquer process to protect the artwork which is perfect for protecting against the varying weather. We bring in professional HD printer for product printing and the printing result can reach 1400 DPI. The durable vinyl coated nylon is resistant to UV, aging and scratching, which ensures a long-lasting company and brand profile. We only use Finger-Safe netting on our bounce houses and combos. While still transparent enough to allow for easy viewing, the holes of this special netting are too small for even the smallest child's fingers to penetrate.The majority of bounce houses on the market, on the other hand, use cheaper standard netting. This means a child can easily fit their fingers through, potentially causing both damage to the netting and harm to the child's fragile fingers. We never cut corners with our products, and always strive to provide the safest environment possible, even if it costs a little more. 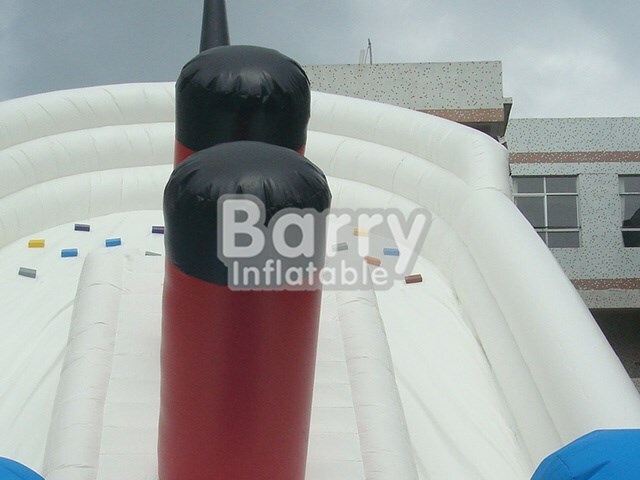 All of our inflatables are constructed from materials that are lead-safe, meaning levels below 90ppm. This is well below even the strict CPSIA and California Prop #65 compliance limits of 300ppm, meaning our inflatables are safe for children. We also use vinyl materials that are flame-retardant and meet the new California NFPA 701, large and small-scale tests. Do your homework before dealing with any inflatable manufacturer, and make sure they're not using cheaper materials that could be dangerous to children. We never cut corners with our products, and always strive to provide the safest environment possible, even if it costs a little more. 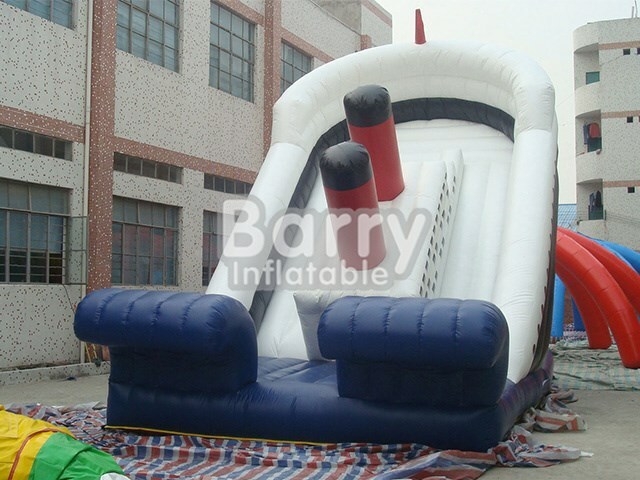 Q1:What kind of inflatable slide do you have? A:Jungle theme,seaworld theme,animal theme,any kind can be customized. Q2:Can you brand my inflatables? Q3:What kind of payment do you accept? A: We prefer T/T, Westen Union, Paypal and other payment terms. Q4:How long is your delivery time ? Q5:Are you a manufacturer or a trading company? Q6:Does your company pass any certificates? Q7: Do you offer some accessories? Q8:Can I check the inflatable before delivery? Q9: How about the warranty?